In comparing electric toothbrushes, one has to consider the motion of the brush, its direction and speed, its brush head shape, and the action of its individual bristle tufts. One manufacturer, Braun Oral B, has sought to enhance the cleaning action of the brush by including a high frequency pulsating motion. Pulsating rotary brushes have a round brush head that is capable of oscillating back and forth at a rate of 7,600 brush strokes per minute. Braun Oral B Company has added a pulsating action which creates between 20,000 and 40,000 pulses per minute, depending on the specific brush model. 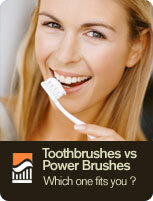 Other types of electric brushes include Rota-dent brand toothbrushes and Interplak brand toothbrushes. The former brand has tiny brush heads which possess a single rotating tuft of bristles pushed into either a pointed or cup-shaped form. While the cup-shaped brushes are meant to clean larger tooth surfaces, the pointed brushes target areas between teeth. Interplak manufactures what is known as "counter-rotational" toothbrushes. Although the brush head of these toothbrushes resembles a standard manual toothbrush, each individual tuft of bristles on the brush head rotates, in the opposing direction as its neighboring tuft.